If you'd like to maintain your firearm proficiency but want a less-expensive way of doing it that doesn't require driving to the range, then get this CO2 pistol! No special range is required other than a BB trap -- and start shootin'! 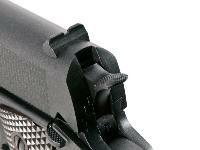 By practicing your grip, sighting, squeezing the trigger, stance and hand position with a CO2 pistol, you'll improve your general shooting skills and soon discover that you're a better shot with your firearms. What about shooting just for the heck of it? That's fun, too. Get this gun if you like realistic airguns that deliver an exciting experience. 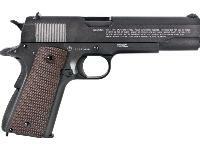 This isn't just a cheap little plastic pistol. It's metal and has a metal barrel. 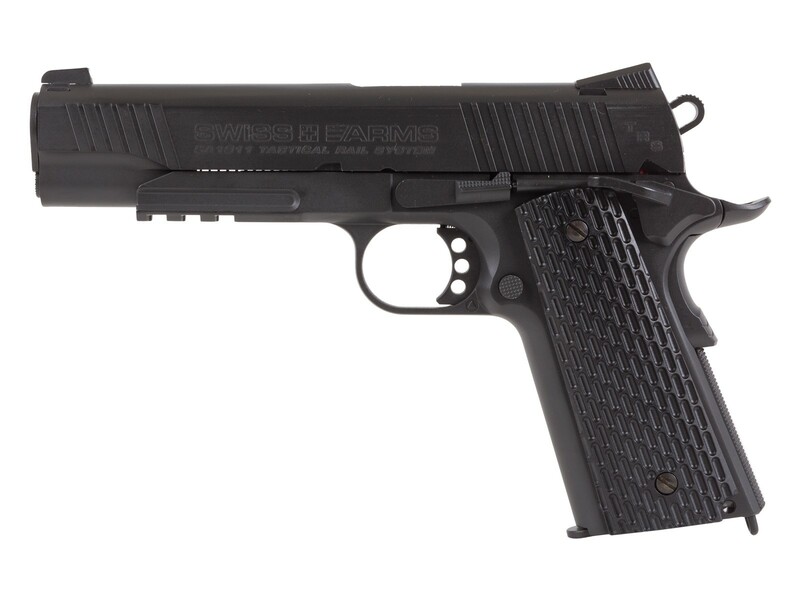 It feels rock solid in your hand and delivers that much-desired recoil (blowback). Things I liked: Great price, (used 10% discount ). Pleasantly surprised my getting 70+ bb's out of a 38 yr. old Daisy CO2 cartridge using 38yr. old BB's. Fairly close groupings using old Daisy's, included Excite's, and the Billes Meatal. (my favorite ). 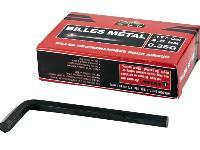 Things I would have changed: Send more Billes Metal bb's with the gun. What others should know: My old cartridges and BB's have been in a unheated Garage for over 30 yrs. no rust and all Daisy cartridges weighed over 42 grams before shooting. 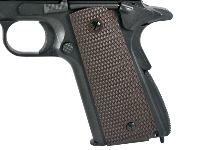 Things I liked: Was impressed with the realism compared to my 70 series 1911 Colt, that I bought new in early 1960's, which also has identical plastic grips from the factory. Field strip and reassembly is almost identical. Was very impressed that there were no casting lines or flashing. At a few feet away practically indistinguishable from a real Colt except for the white lettering and the gunmetal matte finish. If it were made of steel vs aluminum and able to be blued would be identical looking. 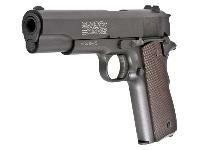 The weight and balance is very close to my 45 Colt. Things I would have changed: Make the internal parts that have high wear points out of steel. 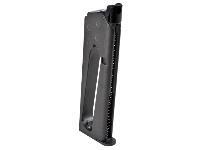 Change the clip so would not have to hold the spring loaded carrier when loading. An easy modification with a Dremel tool that I made, and reduces the max capacity by two B-Bs. Accuracy inside a three inch circle at twenty feet,if there were no flier's would be comparable to my 45 Colt. I tried four different types of ammo, and I could not really see much difference, which is to be expected with a smooth bore. Trigger pull is very good with little creep. What others should know: Blow-back operation very realistic. Even has the same potential for hammer and slide bite if not held correctly when shooting just like the original. 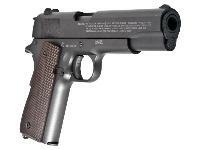 I bought this gun for training others in proper handling,firing,etc before moving to a real 45 caliber 1911. 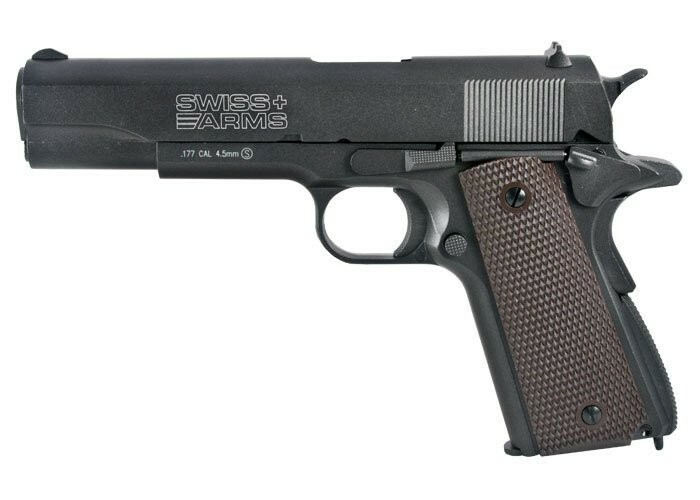 Things I liked: Swiss Arms 1911 CO2 BB Pistol - Best buy 12-12-2015 at $79.99, within 2 week later now $119.99. 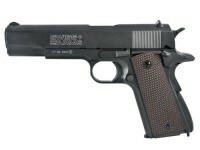 I also have the Colt Commander at $99.99 now $119.99. Both guns use the same magazines so pick the cheapest and buy more. 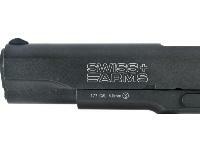 Swiss arms 1911 has the best trigger trigger at 2.5 lbs. 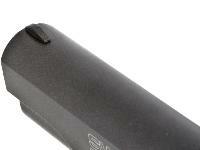 With a full CO2 has nice recoil even tho it does not match the real thing. It is excellent for practicing muscle memory and especially for practicing with left hand. Accuracy is very good and much better than I expected at 10 to 12 yards. Things I would have changed: Drop the price back where it belongs at $79.99. Add 3 dot sights so I don't have to paint them on. This is a price history, not a review.